This past week we were saddened to hear about the passing of a dear colleague and good friend to our program, Julie Rudd Coulombe. We’d like to share the following GoFundMe page that will allow Julie’s passion as a ESL teacher to continue in our community. “The Julia Rudd Coulombe ESL (English as a Second Language) program is named for a life-long ESL teacher in the Ithaca, NY community. Julie recently passed on from a battle with breast cancer; the JRC program is being established to continue her work and provide ESL services for adults in the greater Ithaca area. The JRC will provide English language instruction, civics education, community integration, and English for employment to the region’s burgeoning population of international residents (of which Burmese refugees are the primary constituents). These kinds of integration services are crucial to support immigrants and refugees as they become contributing members of their new community. Donations for this fund will be used to establish the program in a physical space, create a formal 501(c)(3) non profit, and promote it within the community. The current program, with over 100 students (and growing), is operating in a temporary donated space with an entirely volunteer staff of professional teachers. There is a great need for an office space to establish a center of operations for shared resources and teaching space. This April, the Supreme Court will hold a hearing to determine whether the U.S. Census Bureau can ask 2020 Census survey respondents if they are citizens of the United States. The controversial question has not been included since the 1950’s but has been proposed supposedly to help the Justice Department enforce the Voting Rights Act by providing more detailed information about eligible voters. However, opponents and critics of the question argue that including the question might actually lead to collecting even less data. The idea is that noncitizens – especially undocumented immigrants – would be less likely to participate out of concerns for their privacy and the potential misuse of their data. Although the survey will not ask whether noncitizens are in the country legally, some may still fear that the collected data could be used for legal or judicial purposes against them. Noncitizens may not be familiar with their legal protections as survey respondents or may simply choose to err on the side of caution and opt out of responding. This would not just affect the statistical accuracy of the 2020 Census, but would have a significant impact on the way that political power and nearly $800 billion in federal funds are distributed within and among the states. A fair and accurate count on the Census is important because it ensures that communities receive the funding for crucial services and resources. The Census is also the basis for determining how many congressional seats and electoral college votes each state gets. This means that states with higher foreign-born populations, such as New York, stand to lose far more than those with smaller immigrant populations if the citizenship question is included. Even if the citizenship question is deemed unconstitutional, the Census Bureau is already planning other ways of obtaining this information, including by partnering with the Department of Homeland Security (DHS). The practice of partnering with other government agencies is not new, but this partnership concerns many. In the past, the Census Bureau was encouraged to collect as little personally identifying information as possible. This article highlights how data that DHS might share with the Census Bureau could include not only citizenship information, but noncitizens’ full names and addresses, birth dates and places, as well as Social Security numbers and highly sensitive alien registration numbers. Many are also concerned that Census information may be shared with the DHS in return. Fortunately, the Census Act provides basic privacy and confidentiality protections that make it illegal for Census results to be shared with other agencies, including DHS. However, it is up to DHS and this administration to publicly commit to continue upholding this legislation. This is particularly important given the current push to restrict immigration, which calls into question the exact motivation behind these pointed attempts to gain insight into the noncitizen population. Policy experts, such as NYU Brennan Center for Justice’s Wendy Weiser, contend that the Commerce Department itself can still change its position or that Congress could override them. Additionally, ordinary citizens can use their power to advocate against the citizenship question. If you would like to contribute to the conversation, resources such as this petition put forth by the Leadership Conference on Human and Civil Rights are available. Your voice counts to make sure as many people, citizen and noncitizen alike, are counted in the 2020 Census as possible. This week’s Ithacan Immigrant features Evelyn, a Guatemalan national, who came to the U.S. almost 10 years ago looking for a better life. We first met her in 2013 when she came to Catholic Charities to apply to become a legal permanent resident and more recently in 2018 when she wanted assistance to become a U.S. citizen. Evelyn recently had her citizenship application approved and will naturalize later this month. ISP: Why did you come to US? I came for a better life and to make my dreams come true. ISP: Why did you decide to live in Ithaca? I came because I had family here. ISP: What was your first impression of Ithaca? I thought it was a beautiful place because the waterfalls were amazing. I like Ithaca because people here have a tolerance for immigrants, they like different cultures, and they are friendly. ISP: What is your favorite American food? ISP: Where is your favorite place to shop in Ithaca? I like the Ithaca Mall. I like Old Navy, Bath and Body, and I love Best Buy. ISP: What is the biggest difference between Ithaca and your home town? Ithaca has waterfalls, snow, and more opportunities. My home town in Guatemala has creeks, it’s very hot, and there are no opportunities. For immigration advocates and beneficiaries of Temporary Protective Status (TPS), this past week’s Federal Register Notice regarding DHS’s automatic extension of TPS along with work authorization for certain Sudanese, Nicaraguans, Haitians, and Salvadorians was good news. As a result of the lawsuit, Ramos v. Nielsen, temporary relief was provided to tens of thousands of individuals from these four countries who would otherwise be out of status and have expired work permits. Yet again, it takes a court case to temporarily put the brakes on another one of the Trump Administration’s policies that wreak havoc on the lives of immigrants instead of Congress doing its job and coming up with a long-term legislative solution. As a reminder, TPS is intended to protect foreign nationals in the U.S. from being returned to their home countries if the home country became unsafe to return to during the time in which the individuals were in the U.S. The DHS Secretary may designate a foreign country for TPS in three scenarios: 1) Ongoing armed conflict; 2) An environmental disaster or an epidemic; or 3) Other extraordinary and temporary conditions that prevent people from safely returning home to the country. Previously, I wrote a post highlighting how TPS has its pros and cons but it definitely helps recipients to come out of the shadows and lead somewhat normal lives. At a minimum, it allows them to get their needs met – they can get a work permit, apply for healthcare, be unafraid of school enrollment, get a driver’s license, or travel on a Greyhound bus without fearing ICE. Despite being caught in a legislative limbo, these are benefits, perks, and forms of relief that have led to immigrant integration, not to mention peace of mind. Locally, and in neighboring cities in upstate New York, TPS beneficiaries include Hondurans, Salvadorians, Nicaraguans, and Haitians who typically arrived in the U.S. in the 1990’s, prior to the natural disaster that left their home countries inhabitable. They have diligently applied to have their TPS renewed for years, sometimes up to two decades, depending on what country they emigrated from. This snapshot of the TPS recipients in just our part of the country provides an example of how long these folks have been establishing their roots in the U.S. and also highlights that it has nothing to do with being here temporarily. To expect them to untangle their lives, apply for travel permits, and return “home” after living here for decades just doesn’t seem plausible. Especially when you consider their current lives are most likely enmeshed with extended family members, neighbors, people from their religious communities, co-workers, and friends. Not to mention those who have children born in the U.S. and have birthright citizenship. How can they be expected to leave all of that? And how can they be expected to return to countries that have travel advisories issued by the State Department for reasons ranging from crime to civil unrest? Having no legislative solution is undeserved and unjust. While the automatic extension issued by DHS is good for those TPS recipients whose status and work authorization was about to expire, it still begs for comprehensive immigration reform to be taken seriously by Congress; it shouldn’t be left up to attorneys, TPS beneficiaries and advocates to file lawsuits and challenge the termination of TPS alone. If TPS is not extended and the terminations are permitted to proceed, TPS recipients will no longer benefit from a life-saving immigration status that many of them have deservedly held for several decades. And realistically, how many of them would actually leave? This week’s Ithacan Immigrant features Jamileh and Maral who emigrated to the U.S. from Iran in 2012. This mother-daughter duo came to Catholic Charities to start the process to become U.S. citizens. They concurred on most of the answers shown below but like most, they had differing answers when it came to shopping and favorite American foods. We like the US because it is a free country. We are free and people respect living together. Our aunt was living here so that’s the reason we came to Ithaca. It felt like home, it was very friendly. We felt like we were coming to a country city. Jamileh: Macaroni & cheese. Maral: Pepperoni pizza. Jamileh: Wal Mart because everything is there and it’s cheaper than other stores. Maral: TJ Maxx because I like the fashion and you can find a lot of decorations for your home. When you come here it is so quiet. Our country had a lot of traffic, it was busy and very crowded. People were always running around. People here are relaxed and it’s quiet. In December we shared a blog post discussing the Green Light initiative, which supports a bill that would allow all New York State residents, regardless of immigration status, to obtain a standard New York State driver’s license. Governor Cuomo’s counselor, Alphonso David, appeared optimistic about the future of the legislation at the time, suggesting that the proposed Driver’s License Access and Privacy Act would likely pass in the 2019 legislative session. Now, local leaders are contributing to the conversation by voicing their support and urging the governor to act. The letter also outlined the reasons for which they believe all immigrants should be granted access to this state-issued ID. According to these leading law enforcement officials, equal access to driver’s licenses has many practical implications for police and first-responders. Possessing a valid driver’s license facilitates their work by increasing the ease of identification, for example. States who have implemented similar laws have also seen a reduction in both unlicensed and uninsured driving. Importantly, the Sheriff’s letter (below) highlights the role of the legislation in supporting their key principles of equality, trust, and public safety. As the duly elected sheriff of Tompkins County, I fully support the mission of the Green Light NY: Driving Together Coalition and urge New York State to take immediate action to provide equal access to driver’s licenses for all New Yorkers, regardless of immigration status. With the ability to access proper and legal state-issued identification, witnesses and victims of crimes will more readily report and cooperate with police. Law enforcement will be able to use licenses to verify the identity of motorists during stops and review traffic records. Other first responders and healthcare providers will be able to identify the individuals they assist. New Mexico, Washington and Utah – states with the longest implementation of similar access to driver’s licenses laws – have seen a reduction in accidents that involved unlicensed drivers. New Mexico saw its rate of uninsured drivers drop from 33 percent to 9 percent after they granted access to licenses for all New Mexicans. Without access to licenses, many immigrants are unable to purchase, register, and insure their own vehicles. As a result, they face major barriers to meeting the most basic needs of day-to-day life: traveling to work, school, grocery shopping, medical appointments, and places of worship. Out of sheer necessity, many immigrants drive without licenses, putting them at odds with law enforcement, undermining trust between police and immigrant communities, and increasing the risk of a traffic violation. As a law enforcement official, my number one concern is public safety and restoring access to driver’s licenses to undocumented immigrants is key in us achieving that goal. Once again, I urge you to give a green light to driver’s license legislation for undocumented immigrants in our state! I often meet with clients we have assisted to become U.S. citizens who want to bring family members to the U.S. through family reunification. The new citizens often return to access the immigration legal services we offer at Catholic Charities to petition for family members with the majority seeking to bring one or both of their parents to the U.S. as green card holders. In these past few months we have assisted clients reunify with parent(s) from several countries including Peru, the Dominican Republic, Ukraine, Russia, and Liberia. In 2015, I met with Carlos (pictured above) who scheduled a meeting seeking advice on how to bring his mother to the U.S. At the time, he was a legal permanent resident, so we discussed how he had to first become a U.S. citizen in order to petition for her. Carlos then put a plan in motion that included him getting naturalized, his mother getting her green card and even involved plans for him to host a big family reunion in the U.S. that would include his mother and two sisters. For someone who was in their late 20’s at the time, this was quite an ambitious goal. Petitioning for a parent to come to the U.S. can often be a huge undertaking. It’s a costly process and requires gathering a lot of evidence about who you are and who they are, as well as showing you can financially support them once they arrive. It also requires working closely with the emigrating parent(s) to make sure they are prepared for their consular interview. Fast forward to the present. Carlos is now naturalized, has an approved alien relative petition, and is in the final stages of fulfilling the requirements needed for the National Visa Center to contact the Ecuadorian Embassy in Guayaquil so they can schedule his mother’s consular interview. The more I meet with Carlos, the more evident it becomes how deeply he cares for his mother. I’ve heard in the past how much Ecuadorian men love their mothers, and Carlos is no different. So much so, that I asked him to tell me more about their personal story and why it means so much to bring her here. I decided to bring my mother here because I want to take care of her. I don’t want her to have to work or to pay any rent because she spent so many years taking care of me and my sisters. My mom is such a hard worker. When I was younger, she used to work selling food in a little kiosko. She would work from 4:00 in the afternoon and not finish until 2:00 or 3:00 in the morning. At that time, I had to stay home with my two younger sisters taking care of them. My mom has had such a hard life. She was married to my sisters’ father and he was an alcoholic. I saw a lot of things I shouldn’t have seen. She even lost a house at one point. There was a crazy rain and the house cracked and she had to demolish the house. My mom put all her savings into paying the house off because she had taken out a loan so then we moved into one of her uncle’s homes where we would live almost 3 years because she was so broke. We got on our feet and eventually when I was old enough to work and I tried to help her out. She got divorced and she met another man and they dated for 5 years but things didn’t work out and after that, my mom decided to stay single. I eventually moved to the US because my father was living here and he sent for me. But awhile back, my mom started having problems with her arm. For years, she would carry two 50-pound bags, one in each hand, and had to walk about a mile carrying that weight. This injured her arm so the doctor told her she had to stop working. When I found that out, I told her I wanted to take care of her. That’s when I came to Catholic Charities to ask about how to bring her here. One of the main things I want when my mom comes here is I don’t want her to have to work outside of the home. I want her to stay home, take care of the house and cook. I’m 30 and want to have a family. Here having a family is expensive because of the babysitting. When my mom is here, she will take care of her grand kids and this could make her happy. So, my job is to take care of my Mom and she can take care of her grand kids. I was in Ecuador when I got the message from you that my mother’s case was approved. We were both really happy. She’s excited to come here – she has other family in the U.S. and she is excited to see them. Plus, she wants to be with me. My mom suffered a lot and I’ve always appreciated what she did for us. Even though she didn’t have money she was always there for all of us. My dream for the future is to have a family reunion with my mom and my sisters in the U.S. She always taught us family comes first so now I am ready to do for her what she has always done for me. For this week’s Ithacan Immigrant, we interviewed Julian, who emigrated to the US from the DR when he was a teenager. Julian spent time in New York City before moving upstate and resettled in nearby Horseheads, NY. We first met him and his family when they came to ISP to access our immigration legal services. I was 16 years old and my mom brought me to the U.S. to study. ISP: Why did you decide to live in upstate New York? I’m a tailor and I work for a large company. I was hired by Men’s Warehouse in Horseheads and have lived in this area for 5 years. ISP: What was your first impression of upstate New York? I moved to this area and my first impression was “this looks like camp.” It was so peaceful so right away I forgot about the city. There’s a silence here and it’s small. It’s something I love to cook myself – it’s a casserole with shrimp, cheese, broccoli, and celery. My wife and daughter love it. ISP: Where is your favorite place to shop? I like the Horseheads Mall. I love how you can go inside and have so many stores to shop in. ISP: What is the biggest difference between Horseheads and your home town? They are so different. Like the food – in the DR you can get meat, rice and beans, avocado and tostones everywhere you go. It’s not like that here. Another difference is here you feel freedom and there it is dangerous. I really appreciate living here because I’ve made some friends like I’ve never experienced. Like my tax guy, he is so good to me. And the people at work. I have a lot of friends who are customers or other workers. I’m going to stay here forever. Just two weeks ago, Carlos Cardona Fuentes appeared in immigration court in Buffalo, New York, facing deportation. Fuentes, a father, dairy farmer, and undocumented immigrant from Guatemala, has lived and worked in the United States for nearly a decade. In September, as he was driving home to celebrate his daughter’s 3rd birthday, he was pulled over in a routine traffic stop. However, when he could not provide a valid NYS driver’s license, the police turned him over to immigration authorities. Fuentes was held at the Buffalo Federal Detention Center in Batavia, NY for five days and was released on a $10,000 bond. Not only did he miss an important day for his family, but he now risks being separated from his wife, young daughter, and the life he has made here in New York. legislation to provide access to driver’s licenses for undocumented immigrants in New York. Alianza Agricola is a grassroots organization led by farmworkers and is one of several organizations and immigrant advocate groups that have called on the New York State Assembly to pass what is known as the “Driver’s License Access and Privacy Act”, also known as the “Green Light Legislation” (A. 10273). 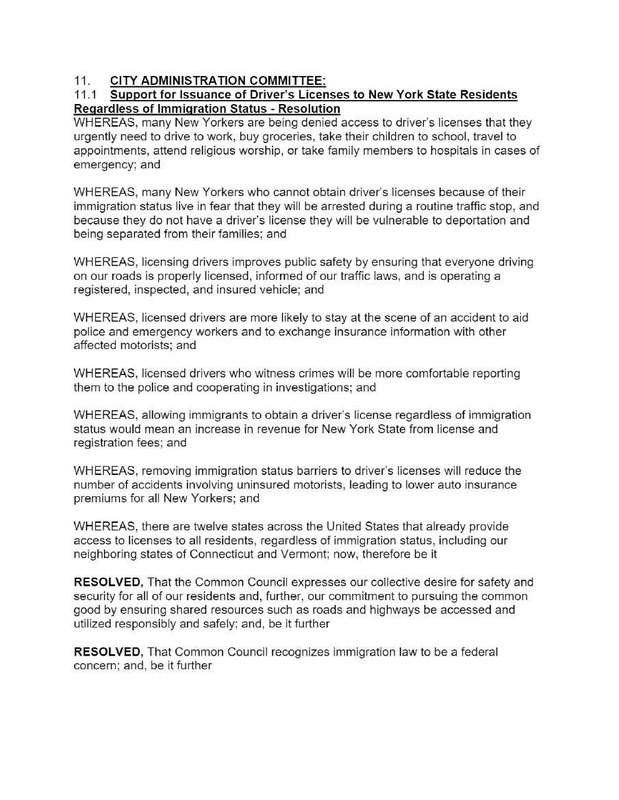 With the passage of this act, New York would join the twelve other states (California, Colorado, Connecticut, Delaware, Hawaii, Illinois, Maryland, New Mexico, Nevada, Utah, Vermont, and Washington) and the District of Columbia, and Puerto Rico that have recognized and addressed the need of undocumented immigrants to secure driving privileges. It would not be the first time that New York would allow undocumented immigrants to obtain a NYS driver’s license. In fact, it wasn’t until 2002 when Governor Pataki made it a requirement to have a valid Social Security number in order to apply for one that undocumented immigrants were barred from possessing a state-issued driver’s license. Now, if the Driver’s License Access and Privacy Act passes in the 2019 legislative session as many speculate, it would give the green light to an estimated 250,000 eligible undocumented immigrants residing in New York to apply through the Department of Motor Vehicles for a standard driver’s’ license. While this license will differ from the REAL ID issued for federal purposes, the DMV will not indicate or record whether a Social Security number was among the documents used to satisfy the requirement for valid identification. This is an important part of the legislation aimed at preventing discrimination against and identification of individuals who possess this limited purpose “standard driver’s license,” including their citizenship or immigration status. Interestingly, California has even seen an increase in organ donations! This week’s Ithacan Immigrant features Stephen, a Ghanian national, who came to the US in 2014. Stephen recently accessed our immigration legal services and we assisted him in becoming a legal permanent resident. One thing he revealed during this interview is he can speak 9 languages! I came here basically because of my ex-wife. She asked me to come to the U.S. on a fiancé visa so we could live our life together here. This is where my ex-wife was living at the time. It’s a nice place. It’s very small but that’s okay. When I first came here I remember thinking it was a friendly city and everyone was very welcoming here. The hospitality they give to everybody who’s not from here made me fall in love with Ithaca. Mac and cheese. I never had it before coming to the U.S. but now I make it at home. I like Ithaca Mall. There’s a lot of stores there so you can literally get anything you want there. My favorite store would be Best Buy because you can just go in there and play music, play games, whatever you want. I can say the biggest difference is here, most people speak one language. In my hometown, Takorado, Ghana, people speak at least 3 main tribal languages. I speak about 9 languages because there are about 50 tribal languages in my country. We have 1 major tribe language (Fanti) but people from other tribes live there so there are 3 languages. I learned the other languages from relatives, friends, and school. I learned English in school. English is the official language for the whole country.